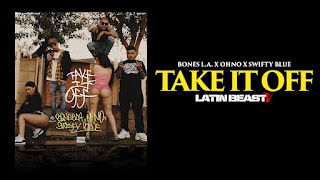 Los Angeles based rapper BonesLA drops the visual to his new single, "Take It Off". Featuring up and coming rappers Swifty Blue and OHNO, the "Take It Off" visual features a host ladies twerking on top of cars throughout various Eastside and Valley neighborhoods as the homies rap their verses. After features with Torey Lanez, King Lil G, Sadboy Loko and more BonesLA its turning the corner and gaining more and more fans as the Latin Trap sound continues to catch on fire across the world. "We know the world is paying attention to us now, so I'm trying to showcase some of the dope young talent that I f**k with," BonesLA said in a statement to the press. "I'm getting ready to drop a whole bunch of new material for the set, we have big plans for the Summer and I want fans to get familiar with all the songs as we prepare hit the road later this year." Throughout the video you can see BonesLA and the rest of the guys smoking on the new "Celui" Le Blase pen. The pen is Le Blasé's first product, which translates to "The One" and hopes to give uses a sense of luxury with a refined vaping experience.